Welcome to Paddy’s Cottage! This recently updated beach chic property is conveniently located in North Palm Beach, FL. The property is ideally set just off U.S. Hwy 1 between PGA Boulevard (Palm Beach Gardens) and Donald Ross Road (Jupiter). Popular beaches of Jupiter & Juno Beach, pristine parks, shopping and restaurants are all located within a few miles of the property. Just west of this street is Juno Park, which sits right on the Intracoastal Waterway. The unit, a complete half of a Duplex, has one bedroom, one bath and comfortably sleeps four people. A large King is provided in the bedroom with a Queen sleep sofa in the living area. The kitchen has brand new cabinets, appliances (including a full size washer and dryer) and all supplies needed for a comfortable stay. 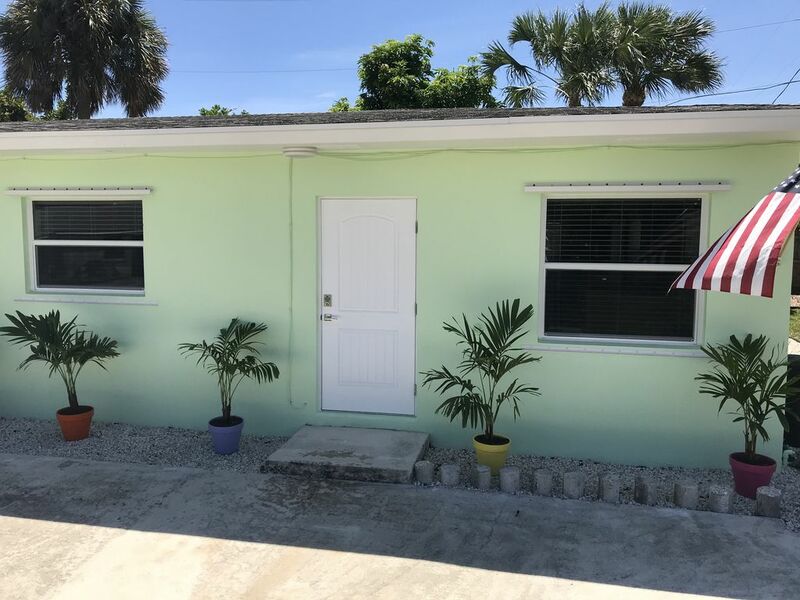 Other features of this unit include a brand new bathroom with walk in shower, all new furniture, wood tile floors and a very spacious back patio. We look forward to having you as our guests. The referenced property is registered with the appropriate taxing authorities for both Palm Beach County and the State of Florida. Walk in shower, vanity with some storage space. Property is located within a few miles of both Juno and Jupiter beaches. 4 bed pillows, set of sheets and bed spread for king size bed, extra super soft blanket for bed or sleeper sofa, sheets for sleeper sofa. Service for 4 is provided with dinner plates, lunch plates, bowls, coffee cups, silverware, and glasses. Pots, pans, cooking utensils, hand towels, etc. are provided as well. See pictures. Comcast basic cable, Amazon Fire TV allowing guests to use their own personal log in information to access Netflix, Prime Video, Hulu, etc. Playing Cards, Boggle, Blokus for 2, Sequence, Yahtzee. Large outside back patio with two Adirondack chairs. OMG This was too cute! Brand spanking clean and all the amenities you would need. Convenient to everything....prime location in an "Olde Florida" neighborhood. we stayed here after closing on our home in Hobe Sound. My husband loved the shower and bathroom so much that it inspired him to want to do this in our new home. John answers all questions immediately and is so friendly. The house is BEAUTIFUL--clean and new! Location was perfect for our Spring training with the Cardinals and Astros, the beach, good restaurants, and shopping. The duplex was a perfect size for 2-4 people and was one of the cleanest places I've ever stayed. Thanks for all the little "extras" you helped me with, John. So nice to escape PA snow in March! We'll be back! This cottage is clean, comfortable, quiet, and newly renovated. It was a treat to stay there. The location is very convenient for beach visits, restaurants, shopping, and sightseeing. I highly recommend this property and the owners and I would definitely stay here again if we come back to this area. Thank you Sandra for the positive review. You were excellent guests and the place was spotless upon your departure. Thank you! Please come back and visit with us again. Property was great! Very clean and comfortable. Very convenient location. John was an awesome host and we hope to return again. We had everything we needed. Thank you for the positive review. You were a wonderful guest and we look forward towards your next stay. Freshly renovated. Nice modern touches throughout. Extremely clean. Comfortable. I would recommend it. The cottage was extremely clean, updated, and had everything needed for a comfortable stay. Convenient location to stores, restaurants and shopping. I will definitely consider staying here again. Thanks Dennis! You were an excellent guest. The place was spotless upon your departure. Thank you! We look forward to your next stay.